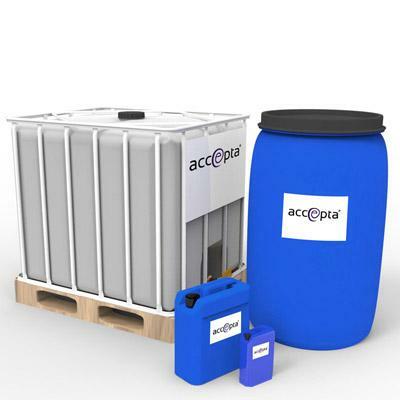 Accepta 0018 is a high performance cooling water treatment comprising an aqueous blend of corrosion and scale inhibitors scientifically formulated for the treatment and protection of open cooling water circuits operating under softened or low natural hardness water conditions. Accepta 0018 is specifically formulated for use in base exchange softened water or waters with low natural hardness. Accepta 0018’s scale inhibitor properties enable this product to minimise the risk of scale formation due to softener slippage or low levels of natural hardness. Accepta 0018 also includes a specific non-ferrous metal corrosion inhibitor. High performance aqueous blend of corrosion and scale inhibitors designed for use in open cooling water circuits. Excellent softened water corrosion inhibition. Very low order of mammalian toxicity. Environmentally acceptable due to freedom from chromate’s and heavy metals. Can be dosed directly from the drum for ease of dosing and handling. Accepta 0018 should be proportional to the system make up to ensure a continuous reserve within the system water. Dosage levels will be dependent upon water quality, system conditions and operational factors. The correct level for your system will be advised by our technical consultant.